Everybody's been buzzing about today being the "end of the world," because it was the last date on the Mayan calendar. The Mayans apparently "knew" that the world would end because they never made a calendar that reached beyond December 21, 2012. There have been plenty of naysayers to this theory of the Mayan calendar. Some have proved that the actual "end" would have landed some seven months earlier--due to the Mayans not factoring in Leap Year. Others have made biblical references and touted that the end would not be determined by a date on a tablet, but rather when God's plan dictates it as such. So, what's the deal with the Mayan calendar just ending on December 21, 2012? John posted the amusing cartoon above yesterday. 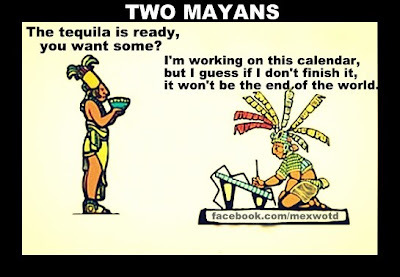 Quite frankly, tequila very well could have played a role in the incomplete calendar! I know I've neglected to finish a project or two in my life, due to excessive "fun." But I truly believe the real reason that the calendar just ended on today's date is due to a common problem that plagues people even today: Kids who refuse to take over a family business. Think about it. Some Mayan family, that was entrusted to creating the calendars by which their civilization planned their daily lives, tried to pass the "business" down to their offspring. And as is the case even today--kids have their own ideas of what they want to do. I can almost hear the Mayan parents trying to convince their son to take over the calendar making business. "Please, son! It's such an important part of our daily lives! This is our family business! It will provide you with something positive to impact our civilization!" "But Mom and Dad! I really want to create an all-inclusive resort and build a fortune!" And so--that's how paradise vacations in Mexico came to being and the calendar creation stopped--effectively fooling everyone into thinking that the world would end on this date. True story.